Uh-oh! The iPad 2 already has a new competitor in ASUS' Eee Pad Transformer. Autobots and Decepticons aside, ASUS is already trying to compete against Apple’s iPad 2 by shipping its hybrid-tablet netbook — Eee Pad Transformer. Eee Pad Transformer’s unique design separates the tablet portion to its main body, which houses a keyboard and touchpad. And as if it wasn’t enough, both the keyboard and tablet portion have batteries. ASUS claims that it has a combined battery life of up to 16 hours. However, it is just an estimated shell life “under certain conditions”. 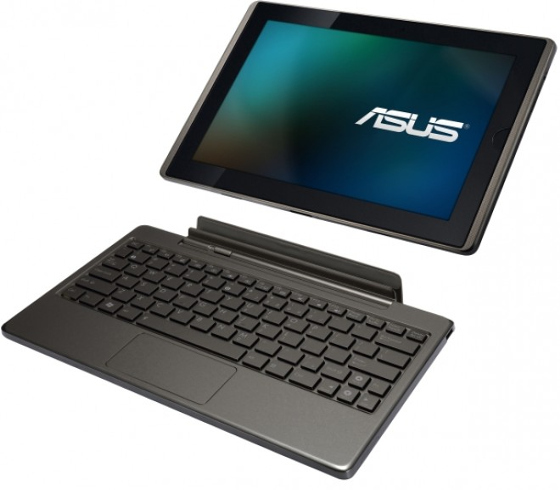 ASUS Eee Pad Transformer also features a combination of its Waveshare user interface and Android 3.0 operating system. That said, the manufacturer hopes that the Transformer will be a “trendsetting tablet experience” with the help of its Android 3.0 with Flash Support. More over, ASUS’ Eee Pad Transformer also features an IPS panel covered with scratch-resistant glass. And just like the iPad 2, the Eee Pad also have two cameras — the front and rear. The front-facing camera capture images on 1.2 megapixel, while the rear camera is a 5-megapixel unit. The keyboard portion has two USB ports and SD card reader. In addition to these, the Transformer boasts NVIDIA Tegra 2 dual-core processor and GPU — making it capable to run high-quality 3D games. With these features, ASUS is definitely making the Eee Pad Transformer “the best tablet choice for users looking for both media consumption and mobile productivity”. So, are you going to grab an ASUS Eee Pad Transformer of your own?